Today’s technologies offer tremendous opportunities for authors to make their out-of-print or otherwise unavailable books more widely available. Some authors want to revive their books by creating e-books, while others may want to use print-on-demand technology or deposit their books in openly accessible repositories. This guide empowers authors to advocate on their own behalf to make their works more widely available, and we believe that many authors can work with their publishers to increase their books’ availability by following the strategies articulated in the guide: Be Reasonable, Be Flexible, Be Persistent, and Be Creative. This guide is the product of extensive outreach to the publishing industry. In the process, we interviewed authors, publishers, and literary agents, ranging from a CEO of a major publishing house to contracts and rights managers of trade and academic presses, editorial assistants, novelists, and academic authors. 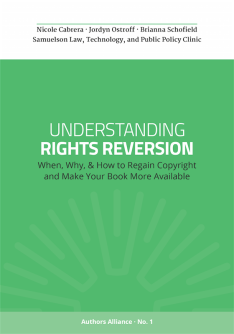 The authors were happily surprised by the consistency of publishers’ responses: across the board, publishers told us that they want to work together with their authors and that they are often willing to give authors their rights back if its in the books’ best interests. Publishers share the desire to “do the right thing” by books that would otherwise languish out of print. Time and again, they received a warm reception from the publishers, authors, and agents, all of whom saw the value in a guide that would help authors keep their works available to readers.